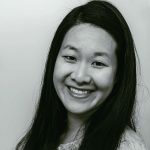 Published Jul 17, 2018 By Julia 4 CommentsThis post may contain affiliate links. 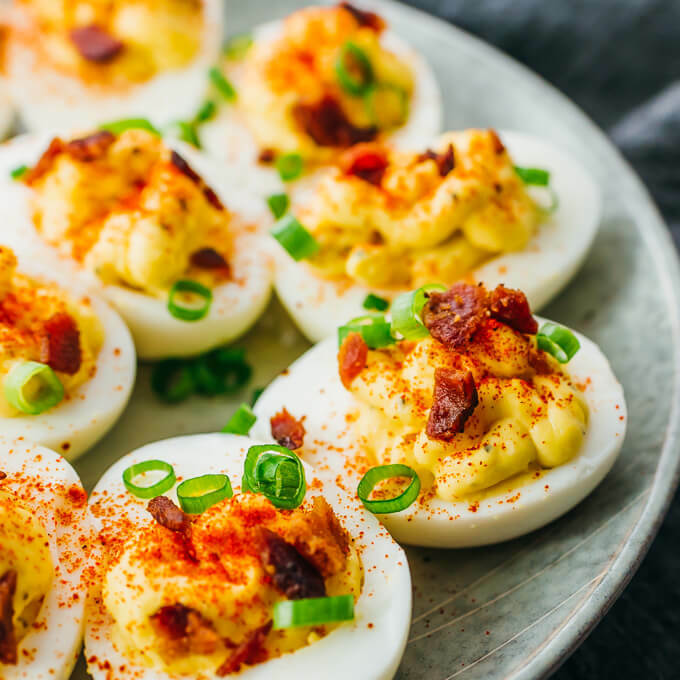 Use the Instant Pot for easy-to-peel hard boiled eggs, great for making these easy spicy deviled eggs. 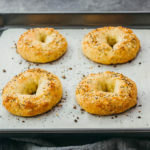 Keto, low carb, and gluten free recipe. The pressure cooker is an easy and foolproof method of cooking hard boiled eggs so that they’re easy to peel. It takes 5 minutes for each of these steps: pressurizing the pot, high pressure cooking, and natural pressure release. 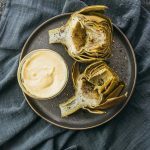 Since the egg shells peel off effortlessly, you can easily use the cooked eggs to make my favorite low carb deviled eggs. I add sriracha to spice them up, and I top them with crispy crumbled bacon for an extra crunch. If deviled eggs aren’t your thing, you can use the cooked eggs to make an egg salad or an egg sandwich. 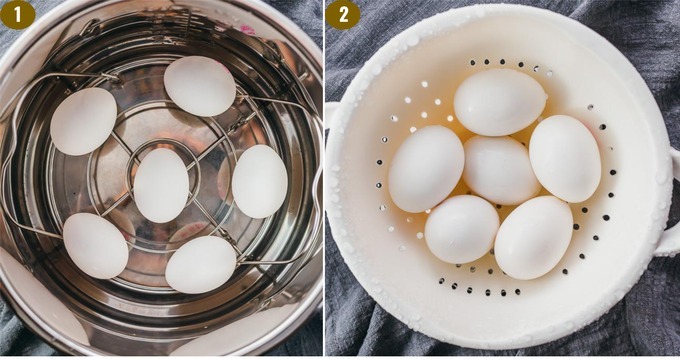 You don’t need a specialized egg rack to cook perfect hard boiled eggs. You can use a trivet, like the one that came with your Instant Pot (pictured above), or a steam rack. Same goes for deviled eggs. 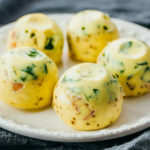 You don’t need a pastry bag and tip in order to pipe the filling into each egg; instead, use a small sandwich plastic bag and cut a small corner of it. Works just as well. It’s best to remove the yolks as cleanly as possible from the egg whites. In my experience, the yolks will easily pop out if you use a small spoon to apply pressure as you scoop it out. You need to be gentle so that you don’t accidentally break the egg whites in the process. If you’re having trouble with yolk removal, you may want to cook the eggs tip-point down to center the yolk. 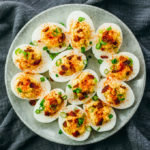 These deviled eggs come with a spicy surprise… there’s a small dollop of sriracha squirted into the empty egg whites before the yolk mixture is added. I usually add a tiny amount, like 1/4 teaspoon per egg white half, for mildly spicy deviled eggs. You can easily adjust the amount to match your preferences. 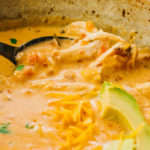 You can prepare your toppings while the eggs are cooking in the pressure cooker. The bacon will take the longest, and since you only need a small amount (1 slice) for topping, you can simply cook it in the microwave. I usually cover the raw bacon slice with multiple paper towels and microwave for 2 1/2 minutes or until crispy. You may need to microwave for shorter or longer periods of time depending on your particular microwave. Other ways to cook bacon include frying it on a pan or baking it in the oven. 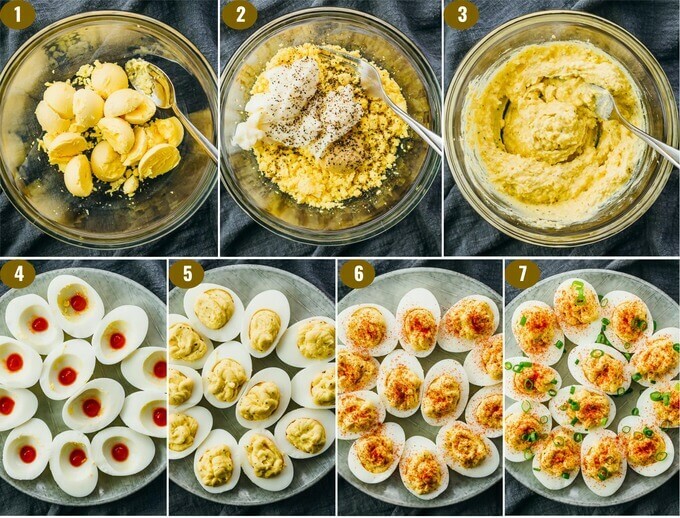 After assembling the deviled eggs and adding toppings, store them in the refrigerator until ready to serve. Personally, I much prefer the taste of chilled deviled eggs and not the room temperature freshly made ones, so it’s best to plan ahead so that you have time to refrigerate them. 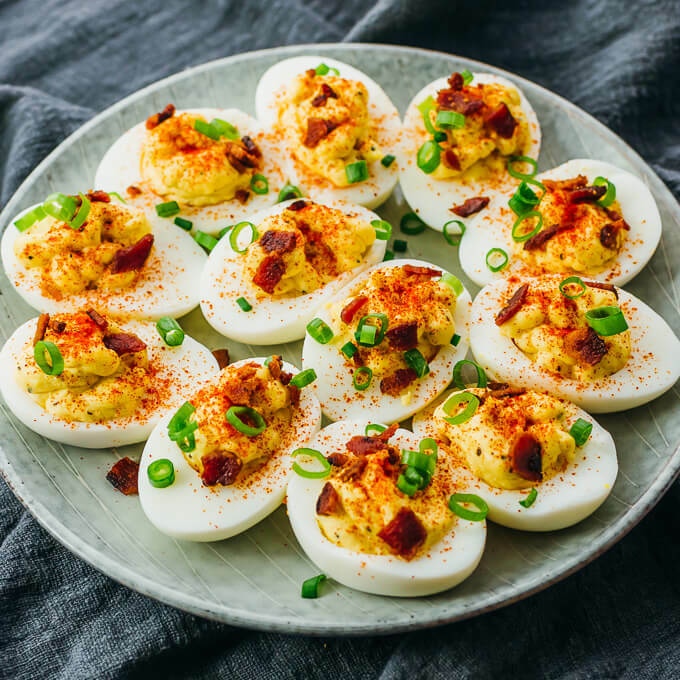 Use the Instant Pot for easy-to-peel hard boiled eggs, great for making these easy and spicy deviled eggs. 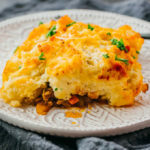 Keto, low carb, and gluten free recipe. Peel and slice each egg lengthwise. Carefully scoop out the egg yolks into a large mixing bowl, and mash them. Add mayonnaise, mustard, salt, and pepper, and mix well. Using sriracha in its squeeze bottle, squirt about 1/4 teaspoon of sriracha into each empty egg white. Scoop the egg yolk mixture into a small sandwich plastic bag. Cut off a tiny corner, and pipe the filling over each egg white. Alternatively, use a pastry bag and tip. 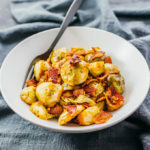 Garnish with paprika, chives, and crumbled bacon. Refrigerate until ready to serve. This recipe yields 0.5 g net carbs per serving (1 deviled egg or 1/12 of recipe). 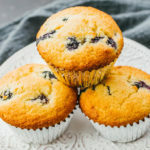 Absolutely delicious and super easy!! Yay, I’m glad it turned out really well for you!! If you use more than 6 eggs at a time does the cooking time change? Hey Rita! The cooking time is the same.